Grain pests often continue to breed inside grain silos long after grain has been removed, as they thrive on grain residue or in old, leftover grain. As the harvest season approaches for another year, the appropriate measures must be taken to ensure grain silos are free from such pests. The seriousness of this issue is perhaps best put into perspective by Darren Hughes, regional program manager, Grains Research and Development Corporation (GRDC). These grain pests multiply quickly, and they have the potential to wreak havoc on your grain. By following these simple steps suggested by Hughes, it is likely that grain pests will be successfully contained. This regulatory process is much more achievable when grain silos are easy to access and examine, such as those from Nelson Silos . The grain silos are equipped with a cone manhole for ease of access, along with either a 2 or 3 sight glass for easy monitoring. Of course, it is also important that these silos are durable and made from high quality materials, as this can help to prevent the entry of such grain pests. The company’s standard superphosphate grain silos are one such example, as their interior is coated with Dulux Amercoat 385 polyamide epoxy primer, a substance that provides added corrosion resistance. Because the grain silos are less likely to deteriorate and fall apart, grain pests will find it much more difficult to make their way into the grain silos when compared to less corrosion resistant models. 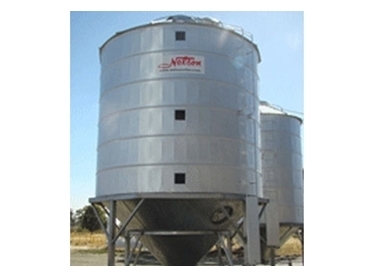 These particular grain silos are designed specifically for heavy duty applications, which makes them ideal for use during harvesting season.